This is the perfect gift bundle for the breakfast lover. 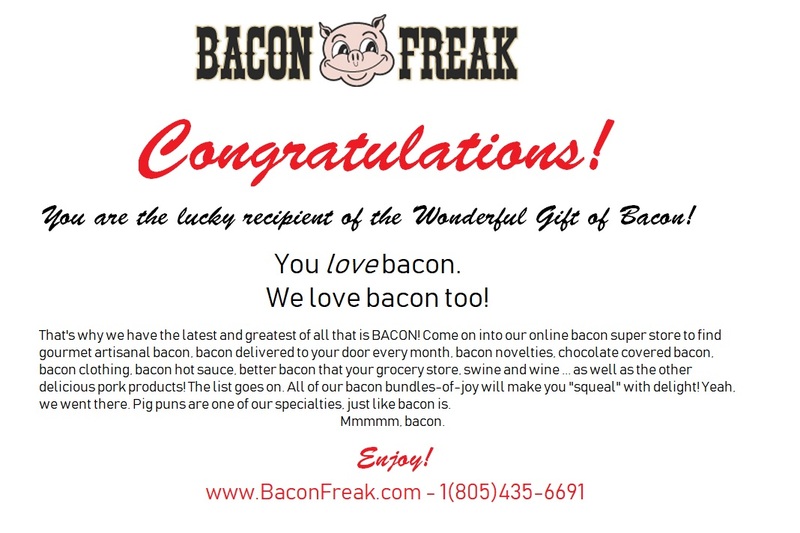 This breakfast gift box has everything you need for a complete bacony bacolicious meal! Our breakfast bundle includes the following items: Boss Hog's Hickory-Smoked Bacon Boss Hog's Bacon is sugar cured and hickory smoked. Our dry-cured bacon will not shrink like packing house bacon because no water is added or used in the curing process. We use a time-honored secret formula and you can certainly tell the difference in taste. This bacon boasts an intense flavor and the meat is succulent. Boss Hog's Maple Bacon Coffee: Boss Hog's very own Coffee. Finally a coffee that is big and bad enough to say, "Drink Me!" Freshly roasted each week for optimum flavor! Whole Bean. 8 oz. bag Boss Hog's Maple Bacon Pancake Mix: Boss Hog has created the perfect breakfast! This Maple Bacon Pancake Mix includes a jar of Boss Hog's Fully Cooked Bacon Bits for the ultimate bacon pancake breakfast.